How the Year of the Rooster affects you! Welcome to the Chinese year of the Rooster. Chinese New Year is the main holiday of the year for more than one quarter of the world's population and the Chinese New Year commences each year in February, using our Western, Gregorian calendar. Using their Solar calendar, they start the year on the 4th February, beginning a new zodiac animal cycle. The New Moon day of 9th February 2005, however, is the official lunar New Year celebration day when you see the dragons out in the streets and the fireworks ignited. 2004 was the year of the Wood Monkey and what a year it was. Now in the cycle of twelve animals comes the Rooster. The Rooster in astrology is an honest, intelligent and candid bird who is generally pretty vivacious and enjoys a good party or trip out around the place. Because of his brilliance intelligence he is rated highly by people and can rely on help from others. He can be very generous and has a great gift for friendship. He achieves his success by being strong willed and needs to learn to master his character which can be very unstable at times. He can be preoccupied and anxious if nothing goes to his liking and can be a worrier about the slightest details. Rooster is quick to speak and to give his opinions about many things. So he can be a bit of a problem to himself at times. He is also charming, charismatic and colourful in his manner. He's usually a lively character being spontaneous and optimistic. He can be very organised and neat as well and is often concerned with prestige and can make a very good networker. In a crisis he can be cool and calm. On the down side he's a conceited and gregarious type who won't stop giving opinions. He can be selfish, unkind, sarcastic, insensitive and lethal with that tongue. Pride, egoism and boasting can be a bit of an issue. 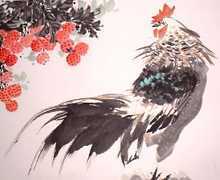 The story of how the Rooster came to be one of the twelve Chinese animals is quite revealing of character. When the 12 were chosen by the Buddha the Rooster saw that a very distinguished gathering was coming together and wanted to know what to do to get into it. The Horse told him that in order to be chosen you had to use your abilities to help others and mentioned the rooster's voice. So the Rooster decided to use his magnificent voice to make it possible to help others. The other animals later suggested to the Buddha that Rooster had done a great job with his wake-up calls, so the Buddha chose him as one of the twelve. The 2005 year ahead is made up of the same elements as 2004. The Chinese element for the Monkey was Metal and so it is for the Rooster. This is what's called the Branch part of this year. The other part of the year's element makeup is referred to as the Stem and is Wood, same as in 2004. This year, however, the two elements are more of a feminine or softer Metal and Wood and are thus Yin in nature. The Wood is sitting atop of the Metal which is not the best relationship between the two of them. There can be difficulty with this as it has been in the Monkey year. With the Yin nature of both elements, a coming together process may be more likely, rather that clashing and antagonisms as we've seen in 2004. The experience of pressure and tension will mean there is a huge need for shifts in the structures of the system within the business and commercial world (ruled by Metal). The Yin nature of the Wood element on top is more that of the flower or the wind. This can be the gentle breeze of the wind stirring the flowers and young trees pushing them to new growth. Sometimes the wind picks up and blows a storm which will happen from time to time in 2005. The struggles over war and terrorism will still be here, however they will not be as antagonistic and there will be bigger efforts made to change things in the world without resorting to more violence. The opportunity for compromise in settling disputes is more possible in 2005. Do not expect thought that all will be roses. The Yin metal of the Rooster is about smaller metal items and among these you can count knives and small detailed jewellery. This means that there is a chance of people being attacked using knives and small weapons. In terms of the large picture this could mean political assassinations or increased petty crime involving weapons and knives in 2005. It can also mean jewellery is favoured this year and jewellers and jewellery makers are therefore a good industry to be in. As Metal rules business, we are going to see big changes in the business world with reforms and new practices coming into being in 2005. New management systems as well as honesty and reform in business will be important. Metal and Wood together can also be about inventions and this will be a year of inventions and technological changes that will be very rapid (especially in the second half of the year), which may be daunting for people who are not able to keep up with it all. The breakthroughs in technology that come can be very exciting and promise changes in agriculture, land practises and the right treatment of the environment. This could revolve around contamination of air and water and new ways of dealing with the consequences of polluting industries. As the Rooster is a great talker then we will see the growth in the talk show business and perhaps many, many opinions in the media on how everything ought to be done. More and more people will be offering solutions to the world's problems, but not all of these are going to be useful or will even solve problems. There will, however, be no shortage of opinions. It will be an exciting year for new ideas and much discussion. The last Wood Rooster year in the world was in 1945 when World War Two was just finishing and the peace came into effect. Note that great battles were fought in the Pacific and in Europe to bring about the end of that war. So the same scenarios may apply in 2005. Also in 1945 atomic bombs were first dropped on civilian populations and the discovery of the Nazi extermination camps came to world attention as the war finished. Similar events and the exposure of hidden facts about what has been suppressed by governments may occur in 2005. Women were first given the right to vote in several European countries that year and the level of scientific discoveries picked up apace as a result of the technologies developed during the war years. August and September will be two months when the Wood and Metal elements rule the months as well. These particular months will see scientific developments picking up the pace. They could also be times when the speed at which the Rooster wants to work his changes will increase dramatically and we'll see swift political and business shifts as well as dramatic revelations about the world or the state of climate changes and pollution levels on the planet. Remember, it was in August 1945 that Hiroshima and Nagasaki entered the world's consciousness as atomic targets and our future history then altered profoundly. On the positive side the world will see some great innovative technological changes. People will be open to be more original and innovative approaches. Issues around money, commerce and changed legislation to update older systems that no longer work will feature. On the negative side people will speak out more, become less tolerant of differing opinions and become restless with a need to be entertained. The entertainment industry and the cult of the 'star' will continue to grow to distract people from the real issues. There could be more large earth movements particularly to do with forests or cities. The destruction of trees and life systems will continue, but the consciousness of the need to change will also grow alongside it. Feng Shui changes for 2005 — in order to make things more harmonious for your household or business in the Rooster year you need to look at what's happening to the Feng Shui numbers/stars in your house. Each year the Chinese community consults a practitioner to tell them where the difficult numbers (Bad Stars) and the supportive numbers have moved to in the house or business in order to avoid some areas and enhance others. There are remedies you can place to effect these yearly energies of the house in 2005. On the 4th February the yearly influences move to new locations. The first two to identify are the Numbers 5 and 2. They are both sickness or 'Bad Luck' stars in Feng Shui. They fall into the NorthWest sector of your house and the East this year. To avoid catching the bad energy from 5 Star you need to place a metallic six piece windchime with hollow tubes in your NW. Alternatively you can hang a bell or other metal item but its best made from copper, brass or bronze. The Number 2 is in the East and metallic items hung or placed in the area will help to allay the effect of the 2. If either of these numbers are in an important area of your house such as the front door, the main bedroom or the kitchen then if you can, avoid using these as much. Change your front door around by using another entrance as much as possible this year. Also avoid hanging any red colours (or pink, purple, orange or earthy colours in these sectors). If your work desk is here try to shift it to a slightly different location. Two other locations will also be sensitive this year. They have the 3 Bad Luck star and the old 7 star. They are the SouthEast and NorthEast. One of the ways to deal with the Number 3 Star is to hang a portion of red cloth or put up a red poster into the SouthEast. The 7 is harder to deal with and needs specialised attention. You could consult a Feng Shui practitioner to hear his/her remedies. Four months in 2005 when the number 5s or 2s double up in the NW or East (and thus create more issues) are in March, June, September and December. During those months its important to add an extra bell or metal item to what's already there. The Grand Duke — each year the predominant energy of the year comes to your house via the direction of the current Chinese animal. The Rooster is in the West and so the energy known as the Grand Duke is coming at you from the West. The Grand Duke brings obstacles to hinder you. Avoid renovations or major changes in that sector this year. If your front door is in this position then a simple Feng Shui remedy is to place a small BaGua mirror with a concave surface (inwardly curved). This concave mirror reflects the Grand Duke back and makes it smaller and it has less impact on the house. Hang the BaGua mirror above the door frame looking out, not on the door otherwise it impacts on your guests. Good Fortune Stars — the numbers 8 and 9 hold the best fortune for this year and they are in the North and the South sectors of any building. If you have a north or south facing front door this is great. Clean up any junk and clutter from those sectors so you can use the energy to great advantage. If your home office desk is in one of these areas then your business will be supported well this year. The number 8 is in the South and 9 is in the North. In summary — if you follow many of these directions here you'll feel you are more in tune with the predominant energies of the Wood Rooster year. Don't get caught up in the fears that may be around in 2005 or the rush to make it business wise, but take your time and remember to listen to others' opinions. The fault in a Rooster year is that you don't listen to whats going on and thus miss out on connecting at a deeper level with friends, associates and family. Holding onto older systems and ways of doing things will also set you up for a fall. Have a Happy Wood Rooster Year and be creative and resourceful. Click here to read how the Year of the Wood Rooster affects you!